And they needed it. Their new home, a low ceilinged cottage built in the 30s, was half the size of their family home and in need of a total overhaul to recapture its southern charm. For Sessions who spends her days designing spaces for the company’s new builds it was a chance to experiment. 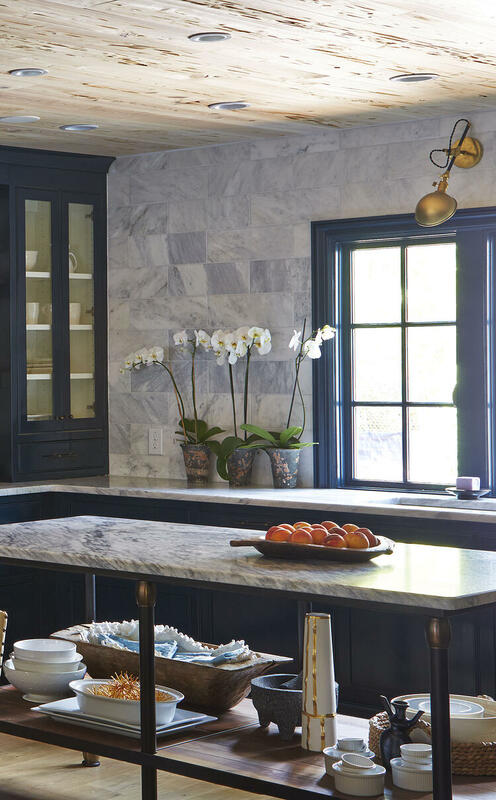 Her most striking experiments in the kitchen are the lacquered teal cabinetry and the Georgia Marble on the island and countertops, a stone that Session has always wanted to work with. For her island and countertop Sessions chose honed Pearl Grey, a white American marble with a deep grey veining quarried by Polycor in Tate, Georgia. (It’s from the same marble quarry that supplied the Lincoln Memorial actually). In her design work for the couple’s development business Sessions has the opportunity to spec and work with a variety of natural stones. 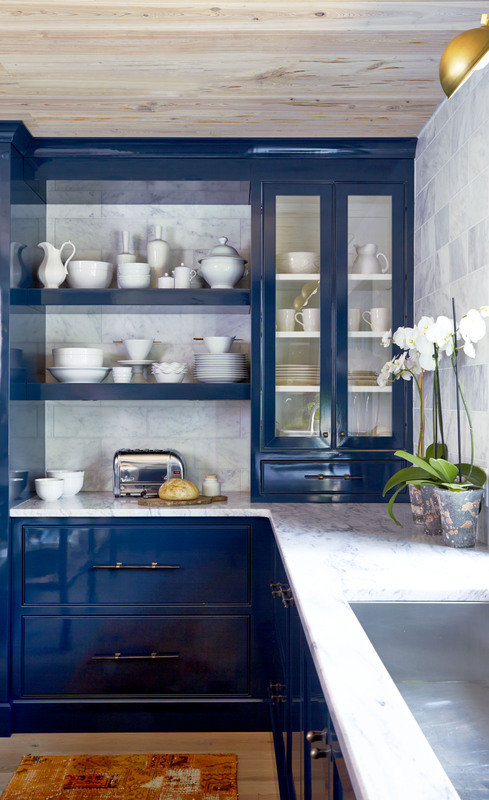 She used Carrara tile she had on hand for her backsplash, but when it came to the countertop it was the unique look, feel and density of the US Marble that drew her in. Though this is her first time using the US marble, spec’ing local materials like the pecky cypress on the ceiling, and using local talent, is standard for the Hedgewood Homes president. Local metalsmith Livingston Metal Work created the island base and hardware from bronze and steel. 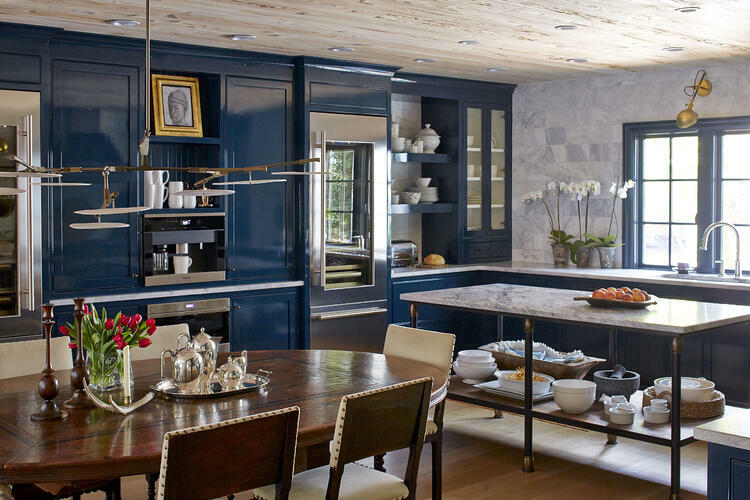 The custom cabinetry finished in Dark Night from Sherwin-Williams was built by Keystone Millwork. “It’s wonderful to have access to such great talent and be able to pull it into one space,” she said. The Georgia-based design and build team are known for building walkable mixed use neighborhoods in the Atlanta area. They especially love carving out a neighborhood in a forgotten corner of the city where good housing and good design have dried up. Each project embodies what Sessions calls a purity of architecture, rooted in the modern architecture of the 20s and 30s. And that means higher end materials, superior craftsmanship and “starting with some rigid style guidelines of architecture and innovating within those guidelines,” Sessions said. “We provide the maximum amount of design someone can get for their budget.” Which she says is an answer to decades of the “dumbing down of materials” when production was emphasized over design. 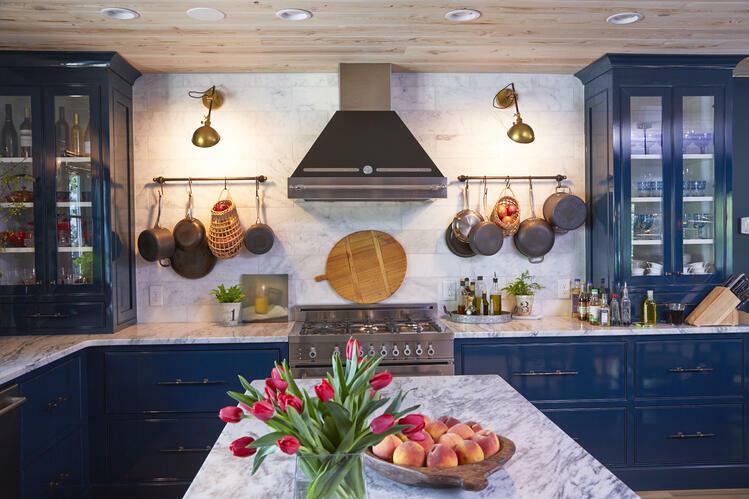 In their business and in their home, Sessions and Donnelly look to Georgia’s natural resources and talent to create beautiful, truly southern homes. “We do as much local as we can, as much American made as we can,” Sessions said. That means an extra effort to shorten trucking trips, hiring local artisans and working with EarthCraft a green building certification program, facilitated by Southface, that provides a blueprint for healthy, comfortable homes that reduce utility bills and protect the environment. All of Polycor’s stones are quarried on the North American continent and owned by the company, which enables them to keep complete control over their chain of custody for total transparency of origin, variety and grade and is also Cradle to Cradle Silver certified. 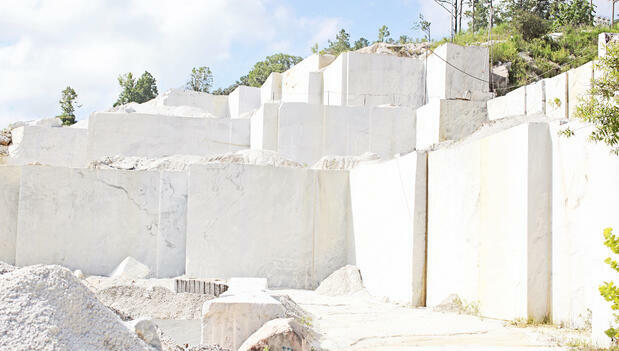 The Georgia Marble quarry is also one of the few zero waste quarries operating on the globe. Sessions’ work puts emphasis on natural materials like wood and stone. (In fact only about 10 percent of Hedgewood homeowners choose quartz countertops). You can see that in her own home with the light white wash on the pecky cypress ceilings and the natural finished white oak flooring. Even her furnishings have distinct character and history. The modern chandelier by Lindsey Adelman is designed and built in New York City. Sessions had a custom banquette and table built to accommodate large family gatherings (20 people to sit down for Thanksgiving! ), but kept the antique dining table she’s “had for a very long time” for the centerpiece for her open kitchen/dining area. It’s wear makes the table look like it has always lived in this space. Like that table, the Georgia marble countertops will grow with her family and her home. She thinks of old country homes where the stone has hollowed just a little bit in front of the sink, the product of a thousand family dinners in a happy home. And that lacquer... Sessions said she wanted to see for herself how would it perform with everyday wear and tear. So how did it hold up? “Beautifully,” she said. Need some more US marble inspiration? Download our design boards, all featuring North American granite, marble, limestone and soapstone. Because American stone is beautiful, naturally.